Whenever user type into a folder view in Windows Explorer, the system will automatically highlight and select the typed items (typically matching first character of both files and sub-folders) listed inside the folder. In you have a large collection or big amount of files and folders saved, Windows Vista has a feature that allows user to quick search the folder by simply start typing. By enabling the automatically type into the search box feature, user will type into the built-in search box instead of going to sequentially highlight the matching items one by one. 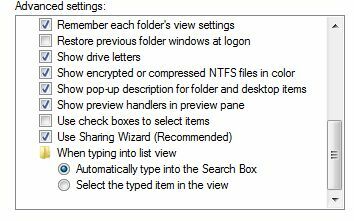 In other word, the focus will shift to the search box automatically when user starts typing into the folder view. When typing into search box, all matching files and subfolders will appear in the result listing. Scroll down to the bottom to locate When typing into list view branch. Select the radio button for Automatically type into the Search Box option. With the feature turned on, all typing will go into the search box to return matching files and folders in search listing. When quick search is disabled, if user want to search inside the folder list view, he or she has to manually click on the search box on top right corner to get focus before start typing.